Please note that this cruise is fully booked for 2019 and 2020; for alternatives on River Cruises, please contact us for personalized assistance. Amatista, is a 35.76 meters long boat, with a unique classic design, which offers great comfort for guests and still allowing for an exciting adventure in the Amazon jungle. 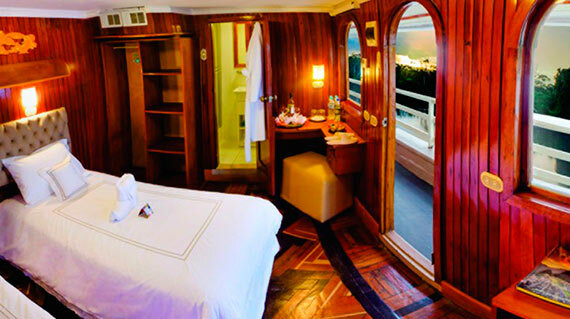 ALL 15 cabins have a private restroom with windows overlooking at the Amazon River. Each room is decorated WITH a beautiful classic style, with wood veneer and they all have air-conditioning for your comfort. One room has the perfect size to guest families (triple cabin). Let’s cruise the Amazon Jungle on board the Amatista! 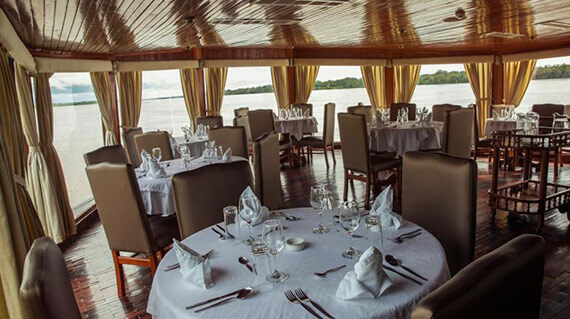 All about the Amatista Amazon River Cruise. The M/V Amatista accommodates a maximum of 31 passengers. This cruise size has been selected, due to being a perfect one to navigate the Amazon River, providing a comfortable dining room, bar, reading room, sleeping accommodations, modern navigation technology, standards for cruising and water safety. 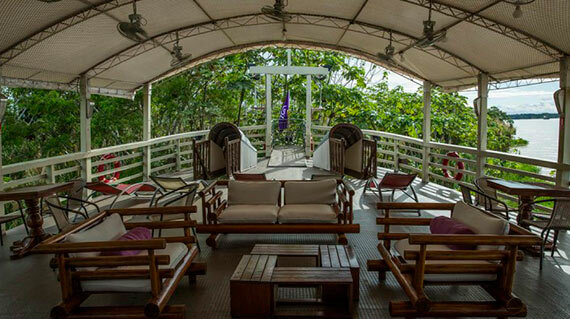 The 15 cabins have a private restroom with windows overlooking at the Amazon River. Each room is decorated in a beautiful classic style, with wood veneer and they all have air conditioning for your comfort. One room has the perfect size to serve families, up to triple accommodation. 12:30 hrs Meet and greet at Iquitos Airport by our Jungle Experience´ staff. Following a 1.5-hours bus transfer to our private Nauta’s pier, where we will get on board. 14:30 hrs Lunch on board. Brief orientation about the journey, while the ship starts the cruise through the mighty Marañon River. 17:00 hrs Boat excursion to the junction of the Marañon and Ucayali rivers, where the Amazon River is formed. This first outgoing let us appreciate birds, iguanas, the beautiful pink dolphins and much more. 18:00 hrs Return to the ship. 18:30 hrs Reception at the ship with Live Music. 19:00 hrs Dinner on board. 07:30 hrs Breakfast on board. 09:00 hrs Boat excursion into the Yanayacu Communal Reserve, through the Yacapana River which is plenty of wildlife; such as macaws, three toe sloths, monkeys, pink dolphins and much more. 12:00 hrs Picnic lunch. We will look for a nice spot in middle of the reserve to recharge energies with a healthy lunch, where some pink dolphins may enrich our panorama. 13:00 hrs Visit to the Mohena or Zapote lakes for fishing some piranhas using Amazon Old techniques. During our way; we may appreciate variety of birds such as toucans, trogons, owls, flycatchers. 15:00 hrs Return to the ship. 18:00 hrs Night boat excursion around The Corriente Lake in the Yanayacu Communal Reserve. We will look for caimans, snakes, tarantulas, scorpions, anacondas, night monkeys and much more. 20:00 hrs Return to the ship. 20:30 hrs Dinner on board. 05:30 hrs Wake up call. 06:00 hrs Birdwatching guided excursion by the Yarapa River. 09:30 hrs Boat excursion through Yucuruchi Creek, looking for the amazing Victoria Regia (Giant Water Lilie) plants and some Shansho (Hoatzins), a pre-historic looking bird. 12:30 hrs Lunch on board. 15:00 hrs Arrival to the AMAZON NATURAL PARK (ANP). ANP is the unique private reserve around the Region, who is running preservation projects on reforestation, flora and fauna. 16:00 hrs Visit by canoe to Laguna Encantada into the ANP. 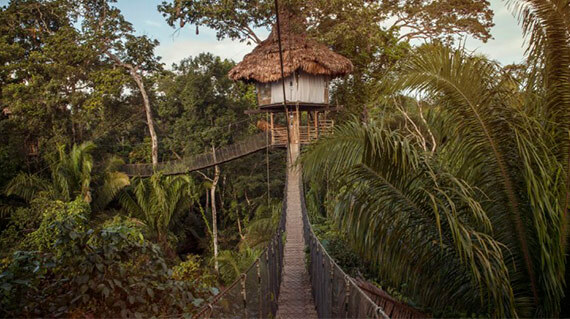 In this ride we’ll have the chance to observe different species of birds, search for monkeys, iguanas and learn about different fishes from The Amazon. 18:00 hrs Reception at the ship with Live Music. 19:30 pm Dinner on board. 08:30 hrs Ceiba trail hike to the spectacular canopy walkway (suspended bridges), looking for a large diversity of wildlife and its precious ecosystem, such as the famous and colorful poison dart frog; whose poison is used for natives to hunt mammals, and the amazing and weird equatorial saky monkey. During the jungle walk we will learn about medicinal plants, some of them unique around this reserve. 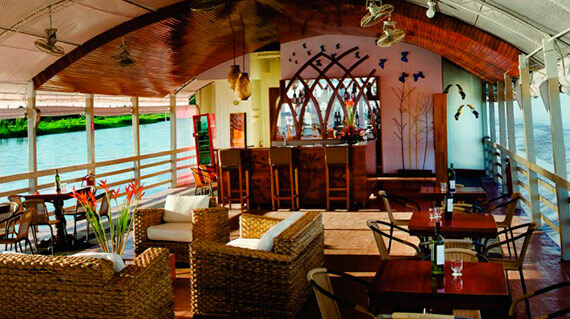 11:30 hrs Arrive to LA MALOKA at ANP, where we’ll have a buffet lunch with live music. 13:30 hrs After lunch we will get deep into our former believes and learn some of our ancients’ secrets of the rain forest, in a Shaman Ceremony. 14:30 hrs Return to the ship. 17:00 hrs Boat excursion to observe the sunset on the Amazon River; waiting for the nightlife to listen the night fauna symphony in Yanayaquillo Creek (Pacaya Samiria National Reserve). During this excursion we will look for caimans, frogs, tarantulas, snakes and anacondas. 19:30 hrs Dinner on board. 06:00 hrs Wake up call. 06:30 hrs Boat Excursion to the Pacaya Samiria National Reserve through Yanayaquillo Creek; a small black water tributary that flows into the Yanayacu – Pucate river, a 25 miles ride looking for wildlife; such as pink dolphins, three toe sloths, monkeys, toucans, macaws and much more. 08:30 hrs Picnic Breakfast. We will look for a nice spot in middle of the reserve to recharge energies with a healthy breakfast, where some pink dolphins may enrich our panorama. 11:00 hrs Return to the ship. 11:30 hrs Meeting for a Geographical Orientation. 16:00 hrs Visit to a Kokama Etno-linguistic Village. 19:30 pm Farewell dinner on board. The ship will sail to Nauta’s Town. 08:30 hrs Check-out and bus transfer from Nauta’s Town to Iquitos. 10:30 hrs Small city tour around Iquitos to see the famous houses dating from the rubber time era, such as Iron House, Belen Market and more. 11:30 hrs Arrive to Iquitos Airport to board your outgoing flight. Capacity: 31 passengers, 3 matrimonials suites, 11 doubles and 1 triple. Length: 127 feet. Width: 28 feet. 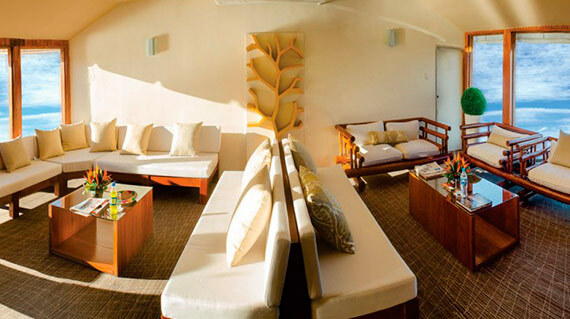 Style: La Amatista is built in the style of a 19th-century Amazon riverboat. Security: Radio communication system with separate battery, satellite phone, life jackets, flare signals, fire extinguishers and smoke detectors in each cabin, onboard defibrillator. Boats: Three auxiliary aluminum boats equipped with four-stroke low emission engines, constant radio communication with the ship. Two boats with capacity of 20 passengers each and one with capacity of 6 passengers. Accommodation: Up to 31 passengers with private facilities. Cabins of 16m2 / 170 sq ft with two twin beds or one queen bed and private bathroom with shower. Equipped with a desk, wardrobe, chest of drawers, dresser, hairdryer and amenities basket. The cabin has smoke detectors and hot water 24 hours a day.